WHEN Mervyn Sloman announced to about 200 people squeezed into his bookshop in December last year that Cape Town would host an international literary festival, everyone clapped enthusiastically and cheered him on. It was his bookshop’s third birthday bash and we wanted to be polite. But a literary festival? On the back of a recession that was ringing the death knell of publishers already struggling for an audience against the stacked deck of television, internet and smartphones? We wished him well as we silently thanked our stars we made our living in other industries. Yet nine months later an astonishingly large festival is here, born fully formed. It is remarkable what creative vision, exhaustingly hard work and determination can achieve, particularly in light of the fact that the inaugural Open Book literary festival starting in Cape Town’s east city precinct tomorrow, is due to the dedication not of a corporate team with a large bank account, but of two people working on a shoestring budget: Sloman, who runs independent book shop the Book Lounge and Frankie Murrey, a book person to the core who was just crazy enough to put her hand up and take on the job. For starters the sheer size of the festival, which continues until Sunday, has taken even Sloman by surprise. He initially planned to organise 50 events over five days, and has ended up organising 150 over the same period. “We’re not sure how that happened,” he said. Sloman and Murrey between them have wooed over 20 international authors, including those many lay readers would recognise. 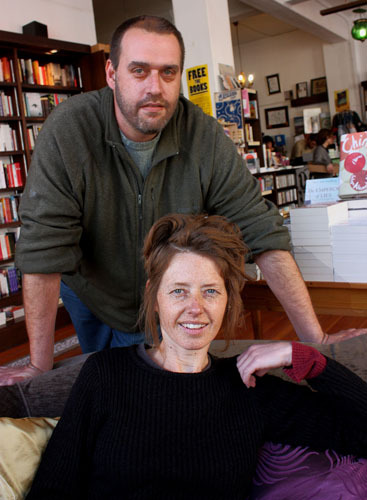 Authors such as Trinidadian Commonwealth Writers Prize winner Earl Lovelace, Londoner Jane Bussmann, Englishman Patrick Gale, and Paul Harding, who won a Pulitzer Prize with his first novel Tinkers. They populate the programme along with a host of other known and yet-to-be discovered gems. The very cream of South African writers both new and established, feature over the festival too, of course. Names such as Arthur C Clarke Award winner and former Big Issue columnist Lauren Beukes. Max du Preez, Ettienne van Heerden, Zubeida Jaffer, Moeletsi Mbeki, Henrietta Rose-Innes, Dianne Awerbuck – the total list of local and international authors runs to 112. But even the world’s best writers launching books and jabbering on about their own writing can be boring to all but their most committed fans. What sets Open Book Festival apart is the inventiveness of the programme. First off, authors discuss their work with other authors. Off-the-wall Lauren Beukes quizzing comic wordwoman Jane Bussmann on Wednesday is a must-see event. Those two are either going to love or hate each other, either way a pairing like that is bound to be entertaining. You can also catch Sifiso Mzobe – this year’s Sunday Times award winner – discuss his debut novel Young Blood with aforementioned debut award-winning novelist Paul Harding on Friday. Authors speaking to authors is the least of it though, you can discover how words made it into the dictionary or watch Writer Sports where authors are put through their paces by the audience. If you fancy feeding both your body and mind you can book a supper and share a meal with eight authors who revive the art of conversation. Even urban planners, geographers and economists have the opportunity to get their spectacles fogged up by the launch of ‘Living in the Endless City’ where they have the chance to speak to the authors of ‘The Endless City’, an original and thought-provoking examination of six cities in the world which has been expanded and broadened in scope (which, if you’re familiar with ‘The Endless City’, might seem impossible). Sports fans have not been left out either. Tim Noakes and co-author Michael Vlismas discuss Challenging Beliefs, hilariously insightful sports writer Tom Eaton is on the programme and there’s an event called Talking Cricket on Saturday. Developing a new generation of readers is high on the list of priorities. Writers are being taken to schools to talk to students and together with Equal Education, Open Book is providing Matthew Goniwe Memorial High in Khayelitsha with a much-needed library painted by renowned graffiti artist Mak1. Look out for the books at the Fugard Theatre, Townhouse Hotel and Book Lounge venues which you can buy as a donation to the library.